The art of Christopher Pratt, a quintessential Newfoundland artist, reflects the land and the people of that place. Although we are accustomed to his vast landscapes and scenes of coastal life, depictions of animals are rare in Pratt's oeuvre. Referring to his 1971 silkscreen The Sheep, Pratt stated, "Sheep are omnipresent on the Southern Avalon: they wander the headlands and graze in meadows on the river flats; they lie by fences and against small red barns...to me they mean St. Mary's Bay." 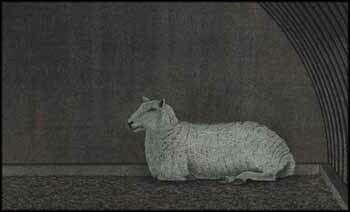 Contrary to this description, this later work, Sheep, Argentia #1, shows an ewe in a grey interior - perhaps an abandoned army bunker - facing to the side with a steady gaze. Argentia, on the southern Avalon Peninsula near St. Mary's Bay, was a US military base from 1941 to 1994. When the Americans arrived, the residents of the town were forced to relocate, and the base had what Pratt described as an "almost ghetto-like" atmosphere, with an "indifference to human values." Perhaps the recumbent sheep, no longer grazing in the untamed landscape of the peninsula, represents the artist's comment on this situation.